For all the justifiable worry about North Korea’s nuclear arsenal, the country is already deploying a powerful weapon to defend its reputation, and make a few (hundred million) bucks on the side: its hackers. A new report in today’s New York Times lays out the many ways in which North Korea has built its cyberwarfare operation into an arguably greater existential threat than its nuclear weapons. The use of skilled hackers to disrupt international relations is lost-cost and high-yield, especially since the country is already under heavy economic sanctions; many of the North Korea–linked attacks originate outside of the country, primarily from China and India, reducing the need for the North Korean government to build out its own internet infrastructure. Experts believe that North Korea derives more than $1 billion a year from its attacks. That includes this past summer’s WannaCry ransomware attacks, which crippled thousands of computers around the world, forcing users to pay up in order to decrypt their hard drives. Among the prominent victims of the attack was Britain’s health service. They also target banks in hacks that are more smash-and-grab, making fraudulent withdrawal requests. The hackers are also particularly interested in anonymized cryptocurrencies like bitcoin and Monero. Other than financial gain, the primary point of North Korean attacks is to protect the integrity of the country’s leader, Kim Jong-un. 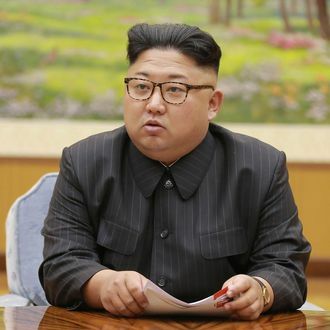 The most well-known of these attacks was the December 2014 hack of Sony Pictures, motivated by The Interview, a film in which Seth Rogen and James Franco kill Kim (Jong-un’s father, Kim Jong-il, was particularly obsessed with film as a form of propaganda and placed heavy emphasis on the form’s power). The hackers disabled 70 percent of computers at the company. Sony was not in a position to launch a retaliatory cyberattack against a sovereign state. So, while you’re waiting for the nuclear apocalypse to cleanse this earth in fire and ash, maybe North Korea is getting ready to rob you of all of your assets instead. Fun!